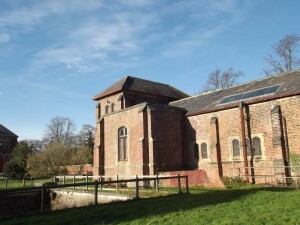 MGM, working for Northumbrian Water and with guidance from English Heritage, have been commissioned to carry out restoration works to the external facade of the pumping station and tower at Coniscliffe Waterworks, Darlington. 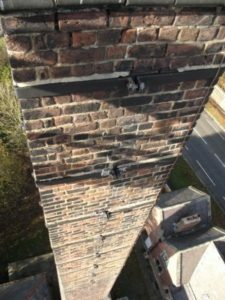 Repair works will be carried out to the roofs and rainwater goods to the Gas Engine House, Beam Engine House and Cottage. 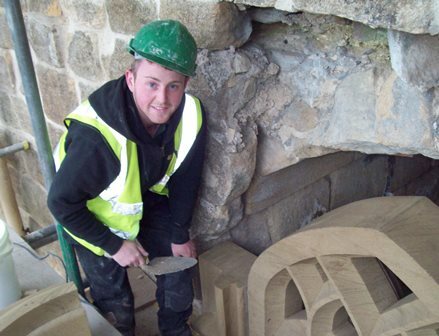 The works also include repairs to the boundary wall to the site which will be carried out by our in-house team of award winning masons and joiners. 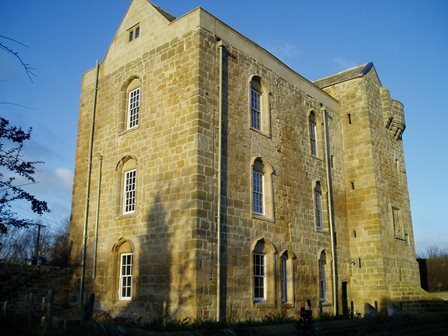 MGM have been commissioned to refurbish historic Preston Tower House in Chathill, Northumberland. 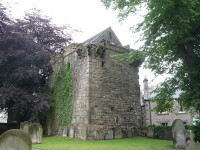 The estate is known for its historic Preston Pele Tower, which was built between 1392 and 1399, when warfare between England and Scotland was endemic. The original tower house burned down in 1782 and the estate was bought by Edmund Craster who built the present house in 1802. The present owners, Gilbert and Gillian Baker Cresswell, have commissioned MGM to refurbish the property to include three new bathrooms, a new kitchen and utility, guest WC and heating system. After 700 years in the care of the Duke of Northumberland, one of Corbridge’s flagship historic monuments, Pele Tower, has been sold and the new owners have commissioned MGM to sympathetically convert the tower into a unique special occasion venue. The three-storey Grade I listed building contains many original features, including a stone fireplace and a 700-year-old toilet. It was restored with a gabled roof in 1910 by the seventh Duke of Northumberland. However, with no water supply or heating installed the scope to use the building has been limited. The new owners, working very closely with MGM, English Heritage and local planning hope to breathe new life into the building, whilst restoring and maintaining as many original features as possible. 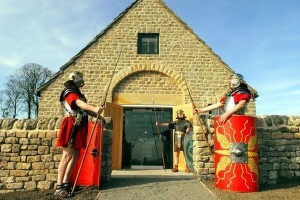 MGM were appointed main contractor by English Heritage during an historic revamp of Housesteads Roman Fort, the most complete Roman Fort in Britain, when The National Trust and English Heritage invested £1.3 million in an exciting two-phase partnership project to redevelop the World Heritage Site. The first phase of the project comprised restructuring the internal layout including removal of two internal brick wall partitions in order to open up internal areas of the building. 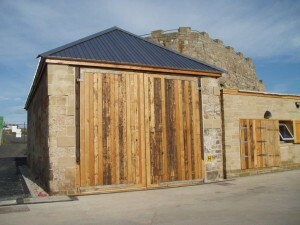 Two side entryways were also removed from the building whilst the gable entrance was reinstated to create just one access point for visitors. Access to the site was also improved through the creation of DDA compliant external pathways. English Heritage Project Manager, Steve Garland, said: “The gable was reconstructed to its original configuration and now includes stunning stone arches that really have transformed the entrance to the building. Many of the improvements to the museum were implemented in order to return the building back to its original layout. This included the installation of two brand new steel roof trusses that were designed to match the existing trusses. The second phase saw the National Trust visitor centre remodelled, alongside improvements to the café, gift shop, toilets and staff accommodation. The car park also received a makeover to provide 40 additional visitor parking spaces at the site. Work was carried out during the winter period and site requirements meant that MGM operatives had to stay in lodgings as snow made access by vehicles impossible. Working closely with the site team the project was completed within the client’s budget and on time for the official opening day. MGM director, Brian Young, said: “We’re proud to be associated with the refurbishment of such an important building on such an important and historic site. “As a company we are very diverse. However, my side of the business is heritage work, so I get a great deal of joy from being part of a project like this one. One of MGM’s most prestigious recent contracts was working for Durham County Council to conserve and restore the Lifeboat House at Seaham Dock, as part of the Seaham Dock restoration project. In recent years the Council has worked with Seaham Harbour Dock Company, One North East, Friends of North Dock Seaham and the local community to bring about the regeneration of Seaham North Dock, which had fallen into a semi derelict state after the demise of the pits in the early 1990s. 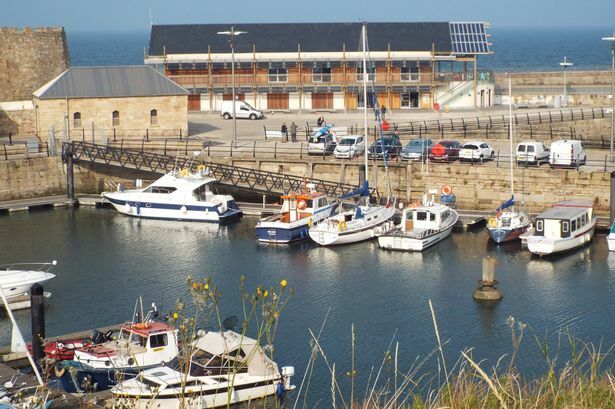 The regeneration of the dock was one of the key objectives of the Seaham Regeneration Strategy undertaken in 1994. The £4m Seaham project to restore and find new uses for the 19th Century listed Seaham North Dock was a direct result of this collaboration, with the town identified as having potential for tourism. The regeneration objective was to maximise usage of the town’s greatest asset – the sea. We completed works centred on the conservation and restoration of the Lifeboat House and the construction of a new building to house a heritage education, sales and display area. The enhancements provided heritage space where the restored George Elmy Lifeboat, together with other heritage items will be exhibited as a focal point for local residents and visitors to Seaham. It is envisaged that the dock will become the central hub for leisure related activity along the East Durham coastline and will provide a destination point along the Durham coastal footpath. The dock award was the 11th with the project has won over the last two years. 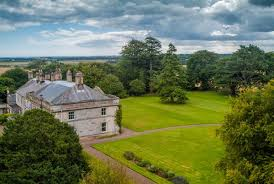 Newcastle University appointed heritage restoration specialists MGM Ltd to renovate a 16th century, Grade I listed building situated on the University’s research and teaching farm near Morpeth, Northumberland. The Pele Tower in Cockle Park is thought to have been built circa 1520 for Sir William, 4th Lord Ogle, as a defensive dwelling and formed part of the Bothal Estate, owned by the Dukes of Portland. It was converted into residential accommodation in the 18th century. In the 19th century, Cockle Park became the Duke’s experimental farm and in 1902 the Tower passed to the County Council and later into the ownership of Newcastle University’s School of Agriculture, Food and Rural Development as part of Cockle Park Farm. The Pele Tower was in a state of collapse and was on the English Heritage Buildings at Risk Register. The stone slab roof coverings and oak trusses had broken down allowing rainwater to cascade through the building, resulting in decay. MGM’s brief was to fully restore the external envelope. The Tower has circular bartizans at its northeast and northwest corners, a machicolated parapet and south windows in Gothic surrounds, all requiring rebuilding. The walls are approximately 1.5 metres thick. The University obtained a grant from English Heritage towards restoration of the exterior of the Tower. The Country Houses Foundation then made a grant to restore one of the Tower’s most important architectural features, the Bothal Window, which had originally graced the upper chamber of the Tower and had been removed in 1830 and installed in nearby Bothal Castle. The original window was located and carefully surveyed before an accurate replacement was crafted and reinstated. All the stone components were made out of sandstone and samples of several suitable quarried sandstones were examined before a quarry in Cumbria was chosen. 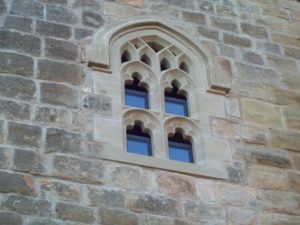 The sill, jambs, mullions, transom and tracery plate are all single stones the full depth of the wall; the eight hood stones half the depth of the wall. The tracery plate is a single stone pierced seven times. 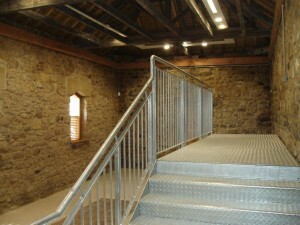 All works progressed as programmed and the building was handed over on time and within budget. Cockle Park Tower is now open to the public on designated days through the year. MGM received a Highly Commended Trophy in Newcastle University’s Excellent Contractor Award Scheme 2013; an annual award ceremony to provide contractors, consultants and suppliers with recognition for excellent performance while working for the University. To ensure that companies of varying sizes can compete equally, contractors are categorised into three bands, according to the number of employees. 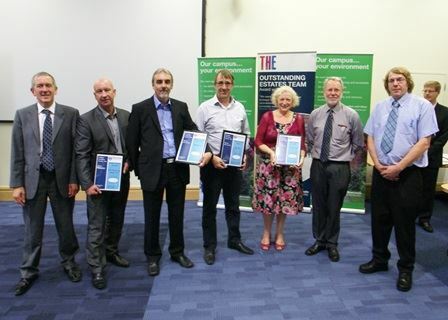 MGM was Highly Commended in the Contractors 50+ Employees category and was presented with an ward by the University’s Executive Director of Finance, Richard Dale and the University’s Vice Chancellor, Professor Chris Brink at a celebratory lunch.